Father and Daughter custom motorcycle builders - Susan Bryan & Gene Montoya share their passion for family and motorcycles. The RIG Racing Team reports from the road in Austin, TX - MotoGP, The Handbuilt Motorcycle Show, Revival Motorcycles and Bed bugs! The sit down with BMW Motorrad - Demo Team Leader and Product Specialist - Cassie Maier . Raised in Albuquerque, New Mexico, Jake Smith headed to California after graduating high school to pursue his dream of working on motorcycles. Part 2 of the Sandia BMW Demo Day - the guys review the demo bikes. In PART 1 of a TWO-PART episode, the guys talk about #VintageBMWMotorcycles, the growing #ModernClassic motorcycle trends and #AdventureMotorcycling with Chris Bronstorp of Sandia BMW. 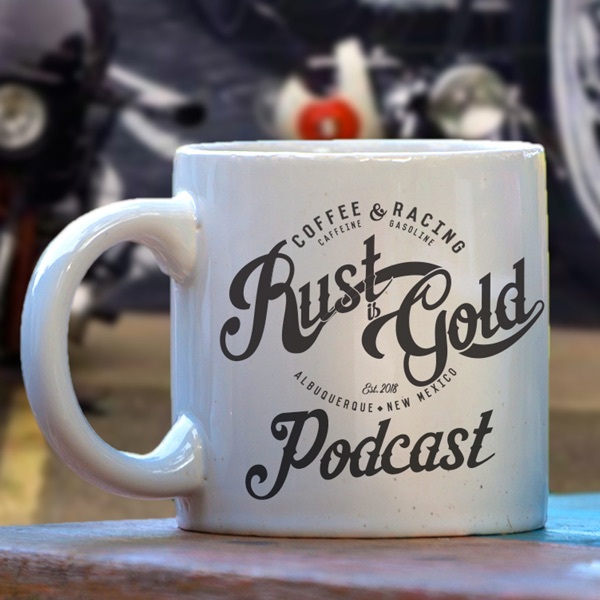 The guys discuss the growing Cafe Racer movement in Mexico. The #RIG Crew test out some new equipment and a #DukeCity Rocker - Devan Daves drops in. Albuquerque native and professional street freestyler and stunt rider, Ernie 'eDub' Vigil. Merritt Hamilton Allen and Gary Potterfield of The Brand Ambassadors, interview Rust is Gold's - Steven Maes. Episode 1: Topics include Motorcycles, coffee and Route 66 vintage style & culture.